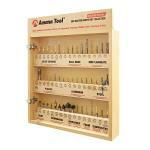 We are proud to introduce one of the most comprehensive offering of CNC router bits for the sign industry. We have bits for plastics, wood, aluminum, corian and most other materials. For plastics, the new Whitesite O-Flute router bits are the best in the industry with polished flutes and proper relief for clean smooth cuts.